As the summer winds down we're gearing up for another year of in-school programming. With Helmets for Kids, Safe Kids Walk this Way, Walk Wise and next phases of our public awareness campaigns in Vietnam, Cambodia, and Uganda, this school year promises to be our busiest yet. And around the world, the issue of road safety is getting increased legislative action from governments including Thailand, Tanzania, and China thanks to the World Health Organization's recently released manual intended to help countries strengthen road safety legislation. On the morning of August 26, 2013, Greig Craft, General Director of Protec Tropical Helmets, held a ceremony to recognize Protec staff members who have been working with the company for 10 years. The annual event celebrates the Protec staff's tremendous contributions to the company, lengthy service, and loyalty. 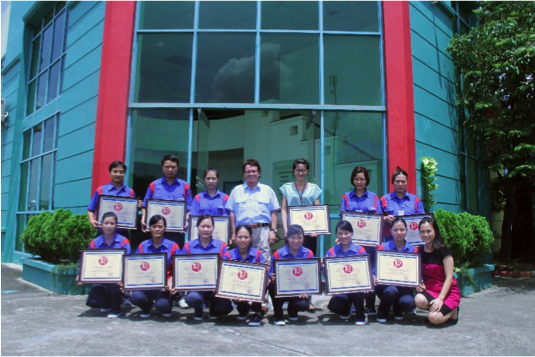 Established in 2001, Protec Tropical Helmets is a nonprofit project of Asia Injury Prevention Foundation. Over the years, Protec has grown to become the most prestigious helmet brand in Vietnam. Protec employs over 200 staff members around the country, working at the headquarters in Hanoi, helmet factory in Noi Bai Industrial Zone, and sales branches in Ho Chi Minh City and Da Nang. Protec also recruits and trains physically disabled workers in order to help them integrate into their communities and lead productive lives. With a dynamic and professional working environment, Protec has created conditions to maximize its staff and workers' qualifications, professional advancement, and promotion in accordance with their capabilities. On behalf of the certificate receivers, Nguyen Hoang Thuy, Sales Admin Staff in the Southern branch said: "I would like to thank the Protec's Board of Management for its care and encouragement through meaningful and practical recognition. This motivates us to work harder and longer with the company." 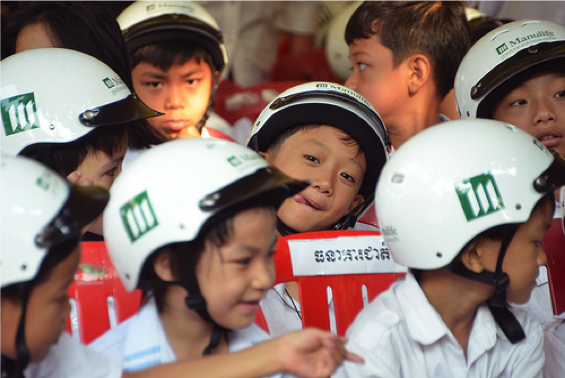 On August 13, a stakeholder meeting convened in Hanoi to evaluate phase 2 and plan for phase 3 of AIP Foundation's public awareness campaign "Children also need a helmet." 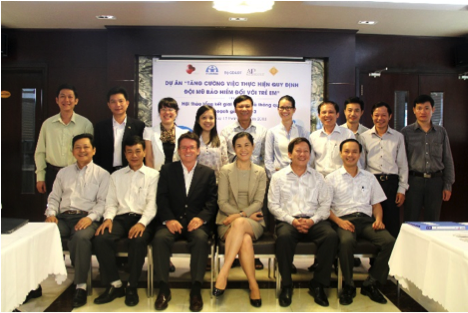 More than thirty stakeholders participated in the workshop, including representatives from the National Traffic Safety Committee (NTSC), the Ministry of Education and Training (MOET), provincial Department of Education and Training (DoET), Traffic Safety Committee (PTSC) and Traffic Police of Hanoi, Da Nang and HCMC. Discussion focused on evaluation of phase two activities and input and comments on plans for phase 3. In addition, stakeholders discussed the findings of training needs assessment that show the demand for increased capacity building for media and legislators around the issue of child helmet use. This September, GlobalGiving, an online fundraising platform, is hosting its first-ever fundraiser campaign designed to help harness the fundraising potential of supporters and their communities. Individuals can create their own fundraising pages and ask their friends, family, and co-workers to join them in supporting our "Give a Vietnamese child a helmet; save a life" project. The campaign includes prizes for individuals who set up fundraiser pages and a $3,500 bonus to the organization with the most successful fundraisers. Our project is almost half-way to reaching its fundraising goal of $20,500 and for this month only an anonymous donor has agreed to match monthly recurring donations. Click here to create your own fundraiser page to help "Give a Vietnamese child a helmet; save a life." Motodops provided helmets, safety lesson The National Road Safety Committee invited 600 motodops to the Cambodia-Japan Cooperation Centre to receive quality helmets and instruction on the importance of helmet use on the road. 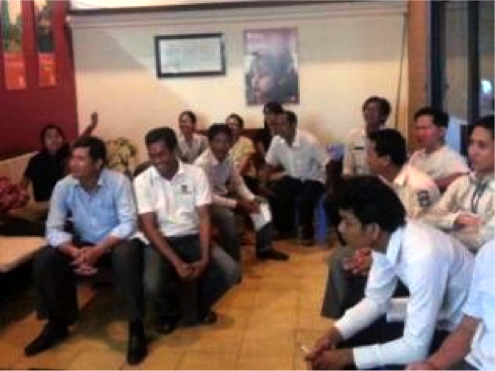 On July 2, 2013, AIP Foundation provided road safety training to 20 staff-members at Travel Indochina in Phnom Penh, Cambodia. The training session covered tourist safety on the road, as well as road safety and helmet use in Cambodia. Participants learned about the importance of helmet use, global traffic fatalities statistics in all age groups, why tourists are at such a high risk of being involved in crashes, safe driving behavior, and pedestrian safety. 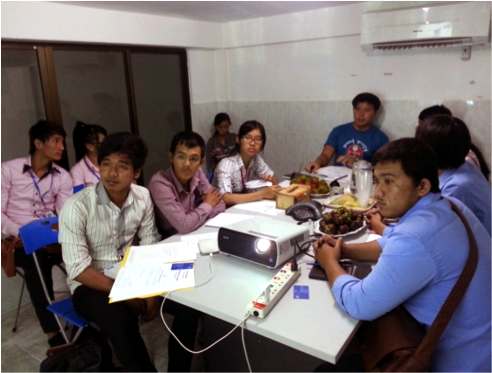 Discussions also covered the differences in the traffic laws of Cambodia, Vietnam, and the United Kingdom. Hun Sen Prek Russey, Kor Ki, and Sampov Meas primary schools in Kampong Speu, Kandal, and Phnom Penh organized extracurricular road safety activities as part of AIP Foundation's Helmets for Kids program. Nearly 600 students and teachers learned about the importance of wearing helmets correctly, how to cross the roads and walk safely, and other traffic safety topics through interactive games and contests. These activities aim to reinforce the lessons from earlier traffic safety training and continue the high helmet use rate into the next school year. Average helmet use rates across the schools, originally near zero, have increased to 80 percent. On July 15, more than 20 parents joined a workshop focused on the benefits of correct helmet use and on parents' roles in making sure that their children wear helmets every day and into the next school year. Training ended with the parents pledging put helmets on their children when they ride as passengers on motorcycles. On July 30, AIP Foundation conducted a focus group discussion with students from four universities in Cambodia to gauge the youth attitude towards the new Safe Roads Cambosia website. Students shared their diverse perspectives and suggested revisions to the site. Many student comments focused on headers, navigation, social media, and publicity. The new site will take advantage of the ubiquity of information technology in everyday life to provide a broad audience with important road safety facts. This information is supplemented by interactive elements such as monthly quizzes and online games. Accounts from survivors and messages from parents put a human face on the statistics, while encouraging users to join the conversation by submitting their own stories. The website has social media integration, and will feature regular petitions, contests and giveaways to maintain interest and encourage participation. In late August 2013, AIP Foundation will hold at least two more student focus groups with this age group. These meetings will be followed by similar consultation with NGOs and other stakeholders in early September. The website launch is planned for September 9, 2013. 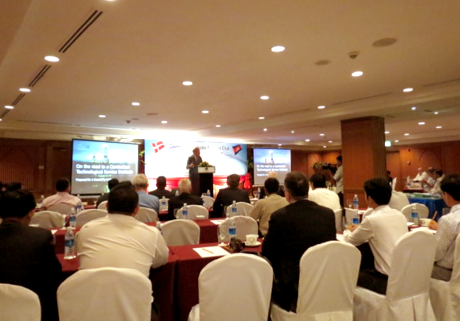 On August 23, 2013, Go4 Bunker Denmark joined companies from Denmark and Cambodia for a seminar to facilitate maritime and oil & gas business partnerships between the two nations held at Sunway Hotel. Go4 Bunker has done work in Cambodia as a sponsor of AIP Foundation's Helmets for Kids, donating helmets to students in Takeo province in 2012-2013. HE Mikael Hemniti Winther, the Danish Ambassador to Thailand, Cambodia and Myanmar and other VIP guests visited AIP Foundation's booth where t-shirts, helmets, stickers, and posters were exhibited.